We drove through another mobile home park recently that was going under the wrecking ball. It had a great location on a major surface street, with a shopping center across the way and medical offices next door. It was at one-time a showpiece, with concrete curb and gutter and wide, curving streets and a clubhouse. There was a nice sign out front. A few of the homes were still there, pending being crushed and thrown in a roll-off dumpster. We noted one house that had great landscaping and a small wishing well that had not been ripped out yet. And my question would be: could this park have been saved? Not legislatively, as there are no laws against re-development and most cities would much prefer a higher property tax-paying use. But economically – what would it have taken for that park to have been worth more as a mobile home community instead of raw dirt? $50 per month higher lot rent? $100? Every time we hear some group such as MHAction call for an end to higher rents, we think about properties like this and wonder if they have any idea what the real-life ramifications are of keeping rents low. And in our industry lot rents are not just low, they are insanely low. Charles Becker, the economist from Duke University that is studying the industry, published a paper recently that declared that mobile home park lot rents are 30% to 40% too low – and that was based on the rents of the largest portfolio owners and REITs. If you compare those rents to the typical mom & pop park, it’s more like 50% to 70% too low. Are you really doing residents a favor by convincing the park owner to keep rents low and then selling the park to Home Depot or some other user for demolition? Or is it a far superior concept to encourage park owners to raise their rents to market levels and keep these communities intact? Personally, we wonder if the folks that join MHAction or similar groups understand that their narrative is to make happy homeowners homeless – because that’s exactly what they’re doing in some cases. Just ask the former residents of the park we drove through. We're sure they’d be more than happy now to pay that extra $50. Back when many mobile home parks were constructed, it was typical for the mom & pop owner to live in a house inside the property. Sometimes on the edge, and sometimes in the middle. Some of these homes can be rather large and elaborate, and others simple bungalows. But the common question is “what do I do with mom & pop’s old house” because modern buyers have no interest in living inside their acquisition. So what do you do with these homes? As with most older single-family homes, there are typically decades of deferred maintenance present – sometimes extremely costly items. A new roof or foundation repair can cost $10,000. And a leaking roof can result in toxic mold abatement, with a substantial price tag. 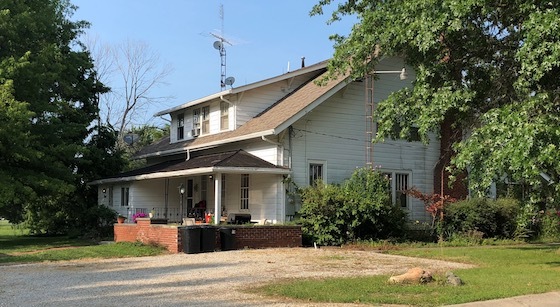 So before you even think about putting mom & pop’s old house in action, do a thorough and accurate assessment as to what it will cost to bring the home back into service. In some rare cases, you’re simply better off tearing the home down if the renovation cost is not economic. How much would it rent for? Assuming the home can be renovated for a reasonable amount of money, the next issue is forecasting what it will rent for. We’ve found that most mom & pop houses rent for a slight premium over the mobile homes in your park. Why not substantially more? Well, for one thing it’s inside a mobile home park, and that’s going to turn off most renters that typically look at single-family homes. Another reason is that these homes are often not as stylish or “new” feeling as the mobile homes are (particularly if you have some new Clayton homes in there). If a new mobile home rents for $795 per month, then the single-family house will go for maybe $795 to $995 per month. Should you subdivide into apartments? Another option in some of the larger mom & pop homes is to break it into sensible apartment units. It’s simply a function of economics and demand. If you can’t get but $695 per month on a 3,000 sq. ft. brick mom & pop home, you are probably better off cutting it into three 1,000 sq. ft. units that will rent for $595 per month. Of course, this is based on the city allowing you to convert the home into apartments. Be sure to ask permission before you attempt to do such a conversion. You will typically need the city’s green tag when you’re done with your work, so don’t think you can fool them. Who should be responsible to market this property? Most mobile home parks are only proficient at renting … mobile homes. So your manager may be a failure when it comes to marketing and leasing a more expensive property. We have selectively used regular single-family management companies for these duties, with often positive results. They will typically charge you one month’s rent as commission, but on a 12 month lease, that’s not too bad. One item that makes this an interesting fit is that your house will probably be the lowest priced home that they have in their inventory. As a result, anyone who can’t afford their normal offerings is an immediate player for yours. This makes it kind of a win/win arrangement, as there underfunded renters would typically just be a waste of time for them. Now for the financial side. The good news is that any mom & pop home in your park is considered “real property” and, as a result, the entire rent is allowed to be “capped” for valuation purposes. In other words, a $1,000 home rent increases the value of your park by $120,000 at a 10% cap rate (although you’ll also have to deduct probably 30% of budgeted expenses). Assuming that you can renovate the home for anything less than $120,000 (and it typically is more like $10,000) it’s a no-brainer. Mom & pop houses are a common fixture in many mobile home parks – and a profitable legacy that you can use to your advantage. Don’t let them sit idle. There’s significant money to be made in the old homestead. Some people who enter into the mobile home park sector from other real estate disciplines have this inherent idea that the dream situation is to own a huge number of parks in one select market. While this seems to make sense from a management perspective, it’s not always the genius stroke that it’s made out to be. While it’s good to have operational efficiencies, the truth is that diversity is much more important. Here’s why. Having a single manager operate more than one property rarely works well. The manager will tend to spend all their time at the happy park that is doing well and avoid the troubled property that needs greater attention. On top of that, there’s no financial benefit from having one or ten parks in the same market. Same water, sewer, trash, mowing and insurance cost. The only efficiency is that you don’t have to drive as far between parks to check on them yourself, or with your district manager. But that’s not much of a financial driver. One reason that “bunching” is not that important is that the fundamental responsibilities of renting land are far greater than renting apartments or other real estate sectors. All the landlord is responsible for is collecting rent, keeping potholes repaired, and the utilities flowing. The resident takes care of their own lot and home. While apartments can actually save money with clustered complexes by sharing employees for everything from painting to carpeting, these are not needed services in a mobile home park. All smart buyers attempt to mitigate the risk of recession in their market, but let’s all admit that nobody can truly predict the future (just ask those who went big into investing in Detroit in the 1970s). As a result, it’s risky business to have too many parks in one finite area. That should make sense to anyone who buys into a mutual fund – there’s much to be said for portfolio diversity among industries. Here’s one of the biggest reasons why having too many parks in one market is not always a great idea. For apartments and other sectors, in the event of a major calamity, the entire asset is insured and you get a check from the insurance company. But in mobile home parks, you just own the land the residents own the homes. So when the homes get destroyed, you don’t get a check and all you get is a vacant lot. Just ask anyone who owned properties consolidated in the Houston market when Hurricane Harvey hit last year. One of the smartest investing tools is diversification of risk. It’s much more important than the lesser operational value of “bunching” properties together. There’s just too much risk in over-weighting your holdings in just a few key markets. They say that the #1 regret of most people before they die are opportunities they failed to take advantage of. At the same time, probably one of the greatest pleasures of some Americans is to reflect on the assets that they built and can give to the next generation to enjoy. So how will you be remembered and what can you do to change that trajectory? Many people have a mental phobia that freezes them in place because they can’t deal well with “risk”. What is “risk”? Webster’s Dictionary says it is to “expose to danger, harm or loss”. While nobody likes to lose money, you also can’t get anywhere without exposing yourself to some element of risk. There’s an old saying “behold the turtle: it only makes progress when it sticks its neck out”, and that’s pretty much true for humans, as well. Therefore, since it’s imperative that we all have to deal with risk to get to our goals, what’s more important is to take calculated risks and mitigate them as effectively as possible. For example, if you are afraid that you’ll lose your down-payment on your mobile home park, work harder to do superior due diligence, and stay away from parks that have poor economics, location or infrastructure. Another way to approach risk is to start small, get comfortable with the business model, and build from there. The good news is that mobile home parks allow you to do that. You can buy a smaller park at an affordable price, and run that park for a year or two until you feel completely comfortable with what you’re doing and then buy another park. One of the great features of the mobile home park sector is that parks come in a wide range of sizes and price points. You don’t have to start with a huge, expensive property. Additionally, most people buy a number of smaller separate properties that can add up to a large business, but maintains good portfolio diversity because it’s not just one giant park. Most park owners have no desire to give up their day job. Why should they? That’s the solid base that they worked hard to build. Mobile home parks do not require you to sacrifice your bread-and-butter profession. Because you are just renting land, the management requirements are low (around 4 hours per week) and you can visit your property only a few times a year and, even then, only on weekends. There is no part of the mobile home park management process that necessitates any activity at all be conducted during the normal business day. One final unique attribute of mobile home park investing is that you don’t need to buy more than one park typically to meet your investment goals. Here’s an example. Let’s assume you found a mobile home park that has a $700,000 price point. You need $140,000 as a down-payment, which just exactly meets your target. It’s got 50 lots with 100% occupancy, and the lot rent is $200 per month. Your cash-on-cash return is 20%, so you’re making $28,000 per year off your down-payment. But here’s where the real firepower is. You raise the lot rent $100 per month over three years, in keeping with market lot rent of $300 per month. That one change makes you 50 x $100 x 12 = $60,000 of additional cash flow, which goes straight to the owner. So you have effectively taken $140,000 and made that into an annual income of $88,000 per year in perpetuity (not even including future rent increases in keeping with the market and inflation). It’s worth nothing that $140,000 left at the bank in a CD at 2% would only garner $2,800 per year, by comparison. If you want to build a legacy for your family, you can not choose a better avenue than mobile home park investing. There are many different methods utilized to collect mobile home park rents. Some work better than others. How do you choose the correct method for your mobile home park? What are the lessons learned? In this system, you give the resident a monthly invoice and return envelope, which is addressed to typically a P.O. Box near your home or office (but you should never use your home address for privacy reasons). It’s the same way that customers pay all their other bills (such as VISA and utilities) so there’s no reason you can’t have them do the same with their monthly rent. The positives of this method are many 1) no reliance on the manager to collect rent 2) no chance for embezzlement by the manager 3) you personally handle all logging in of rent for accuracy and 4) you make the deposit to you know it’s been made. The negatives are 1) residents will frequently claim the rent was “lost in the mail” 2) the time delay of receiving your money and 3) most parks are not set up this way when you buy them, so you have to retain everyone. One tip: you do not have to put return postage on the envelope. We’ve tested both ways and there’s no correlation between putting postage on it and higher rates of collections. Most everyone is smart enough to know an envelope needs a stamp. This is the industry standard. 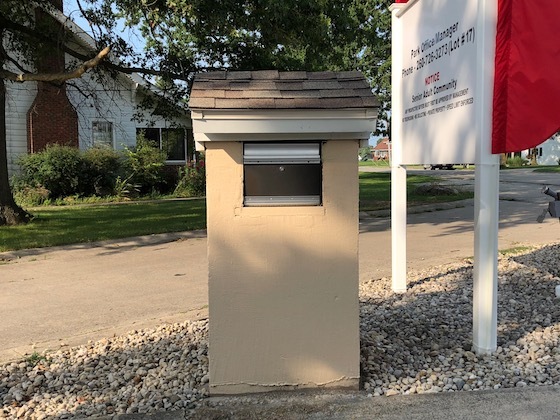 The park office has a mail slot in the door to place rent or, if the office is open, they can simply hand it to the manager and get a receipt if they want. The benefits to this type of program are 1) real-time receipt of rent with no delay factor 2) the ability to actively engage your manager in the rent collections process (which yields higher collections rate in most cases) and 3) no possibility of the use of excuses like “the check is in the mail”. The negatives include 1) the reliance on the manager to make deposits 2) the danger of the manager incorrectly identifying which rent ties to which lot and 3) the risk of the manager losing the deposit before it’s made. Under this program, the resident goes to the park owner’s designated bank each month and makes a rent deposit directly into their account. The benefits are that it gives real-time accountability coupled with no manager middle-man reliance. The benefits to this program are obvious, as it cures all issues from making sure that the resident’s name is on their check to their being little risk to the rent not reaching the bank. The downside is that most mobile home parks in the U.S. do not have residents that can succeed in this level of sophistication. Bear in mind that no other bill out there is paid in this manner, with the exception of the used car “buy here/pay here” lots in which the car payment is delivered to a drive-up window each month. This is the highest point of the payment pyramid, from all perspectives. In this plan, the resident has automatic payment withdrawal from their bank account each month on a prescribed date. The benefits are obvious: it solves every issue from manager reliability to making sure the rent is matched to the correct tenant. The problem, of course, is that few affordable housing customers have this capability as many don’t even have bank accounts. But in some more affluent parks, this system is gaining wider acceptance. 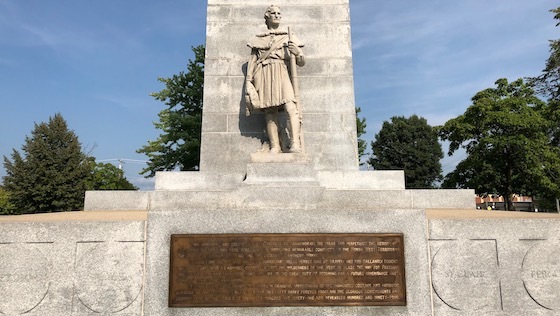 What has the park used in the past, and does it work? In selecting which of these programs your park should use, the first question is “what’s the park doing now and how is it working?” If the answer is that collections are good, then you take some degree of risk in changing it. If residents have been using the same system, and have been trained in doing so, for decades, then there will certainly be a bumpy start to any modification. Remember that the whole point is to get the money in the account, and no one payment process is superior to the other except in its ability to hit that goal. How sophisticated are your residents? Of the payment methods shown above, there is an obvious difference in the sophistication to pull them off. Anyone can mail in rent or put it in a door slot or hand it to a manager. But it takes a higher level of sophistication to make deposits directly into a bank or set up for auto withdrawal. Choose a program that realistically meets the abilities of your residents. There are many different ways to collect rent for your mobile home park. Assess what’s working when you buy the park, and what meets the abilities of your residents. 100% collections are attainable if you choose the right method and run a strictly no pay/no stay policy. Older mobile home parks often come with all types of free-standing buildings. These obsolete structures once served as everything from laundromats to garages for park vehicles. They can be both large and small, and wood or masonry construction. We’ve even had a giant building that the former owner used to restore and warehouse his collections of classic cars. In the photo above, a new owner has retrofitted such a structure as a residence. And that’s what we call a smart owner. There are two types of revenue in any mobile home park: real property and personal property. And only real property is used in most appraisals, bank loans, and the value derived from application of the cap rate. Real property income includes lot rent and any stick-built structures (homes, apartments, commercial buildings, etc.). It never includes mobile homes. So any structure that you can make income producing will be worth at least ten times the amount of annual net income it derives (at a 10% cap rate). Another piece of good news is that mom & pop builders did good work on most structures, with concrete slab foundations and hefty construction. As a result, you can typically get these structures – if abandoned – back into service relatively quickly and with a strong finished product. Remember that most of these things were built for the owner’s personal use, so they did not spare on the cost. Before you even begin to decide on what the use for these structures could be, you need to discuss the options with the folks at city hall. They will have definite opinions on what they will and will not allow. Typically, residential uses are a given, since that’s what the property’s main business is, but they may also allow some commercial uses if you ask. Your park is in the housing business, so stick with what you know and advertise for. If you can put in a residential unit in that old park structure, you’re already getting customers in the door and all the ads you’re running have benefit. On top of that, there’s no learning curve on another business model, and we’ve found that residential rental rates beat commercial in most applications. Of course, another benefit is that you probably already have access to a rehab team that knows how to build a decent housing product. It should also be noted that these type of retrofits are a true win/win, because empty buildings are bad for your property and higher values are a great motivator. And that does not even count the more esoteric benefit of helping to solve America’s affordable housing crisis – at least for one household. You’ll find that city hall will be supportive in removing the danger of an empty building that is an open invitation for vagrants. Every structure in your park should have a productive use. Smart owners tap into these sources of additional income and value and make them into modern dwellings or commercial spaces. Are You Going To Be At The TXMHA Convention September 16th To 18th? If So, Then Come By And Say Hi To Frank! Every state in the U.S. – except for Hawaii – has a manufactured housing association. And one of the best is the Texas Manufactured Housing Association (also known as the TMHA). This association has so much strength that it actually was able to change state law to better serve community owners regarding grandfathering, as well as to fend off the onerous HUD installation standards that have raised the cost of installing homes in many states by as much as $10,000. On top of that, they routinely deal with issues of great importance to the industry and act in the best interests of all community owners in the state. Our opinion on these type of events is that if you can come away with even one great idea, it more than pays for itself. So we attend them with great regularity and can credit conventions and industry meetings with many of our new initiatives. Frank is attending this event and will be speaking on September 17th on the topic “The Top Ten Tips on Buying and Selling Communities”. It’s also worthy of note that Charles Becker – the economics professor from Duke University – will be giving a presentation titled “Trailer Park Economics”, and he’s become a major source of statistical information on such issues as rent levels. You can view the full schedule of speakers and events here. To register, click here! This is a great advertisement for a mobile home from the 1950s. We found it in an antique store on the road. 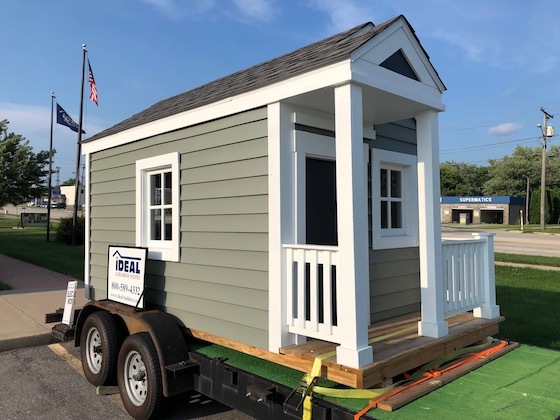 The slogan is “Invitation To Smart Living” and it is very similar to Clayton’s “Have It Made” ad campaign from last year, in that it highlights the benefits to the product and avoids any negative stigma that pops up with most mobile home ads. If there were more ads like this in the U.S. today, it would do a lot to break down the unfair stigma barrier that has plagued the industry for decades. I was driving down the highway while looking at some parks recently, and I saw this unique little home on a trailer. It was parked in front of a home builder’s office. Evidently, they must haul it out to events like parades to advertise their services. And I thought it had one interesting idea that could be used on mobile home design. One of the great faults in the traditional mobile home design is that it exposes the homeowner to the ravages of nature when they walk out the door in the pouring rainstorm or blinding snow storm. It turns going out your front door into the same effect as going out your car door. I don’t know of any traditional single-family home that does not have some type of permanent overhang that keeps rain and snow from going in your front door and gives you time to open that umbrella. This home builder has put an effective shelter over the door that blends in well with the house. And, although this is already a part of front entry home design, why not put it on the more traditional side of the home, as well. Mobile homes look like a “shoe box” to many customers. This could be eliminated by having another feature that gives it not four sides but seven – at least visually. What the builder has done here makes his tiny shoe box home have more of the look and feel of a stick-built house with one simple addition. I think that anyone would agree that a rectangle is not the shape we all think of when we think of a finer home. This makes me then wonder if you could simply factor these type of overhangs into the traditional decks on the mobile homes. It would kill two birds with one stone, giving the customer a shady place to sit in the summer, a protected one in the winter and during storms, and even a protected place for nicer outdoor furniture. Surely, these type of item could be built to attach to the home in a manner that meets HUD regulations in a reasonable cost format. I know that “park models” (homes under 400 sq. ft. that are used in RV parks) already utilize this feature. Could we add this to HUD-code mobile homes, too? We see interesting ideas all the time in the field. Some of these might have builder applications. While the interior of the standard HUD-code home has never been better, there is still room for improvement on the exterior designs. It’s well known that we prefer markets with metro populations of 100,000 and higher. But can you still do well with a metro less than that? When would you be willing to invest in a market that’s smaller? There are many considerations on this issue. Some states have stronger mobile home park environments than others when it comes to smaller metro markets. Colorado, for example, can easily support a mobile home park in metro populations down to 10,000 in size. Meanwhile, Arkansas cannot. This is probably due to an attribute we call “contrast” – where steep housing costs make the pressure for affordable housing so red hot that small markets still ring the phone off the hook. What’s the median home and apartment price? 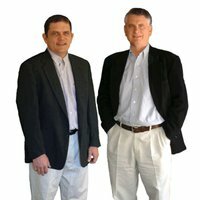 To see if you have this “contrast” in the market you are looking at, go to www.Bestplaces.net and see what the median home cost and average 2 and 3-bedroom apartment rents are. 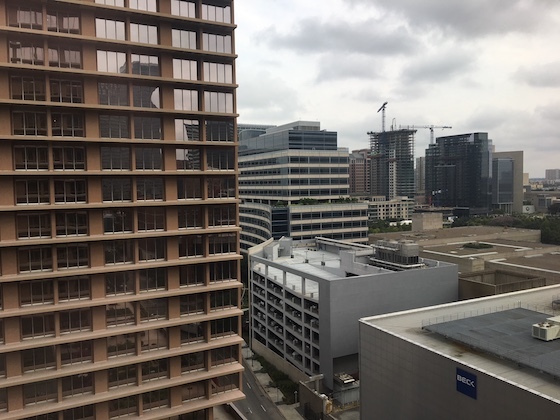 If you have greater than $100,000 median home cost – and many Colorado markets are 3 to 6 times that – as well as apartment rents of greater than $1,000 per month, then the demand for affordable housing becomes severe. What was your test ad result? The proof is in the pudding when you run your “test ad” for the park. Simply place an ad in the “mobile homes for rent” section in the largest metro newspaper, as well as on Criagslist, for 10 days and see how many calls you get. In markets with insanely great demand, the phone will ring with 20 to 50 customers over that 10-day run. This is the most accurate reflection of the strength of your market. What’s your employment base and how diverse is it? In smaller markets, a particular concern is if there is enough diversity in employment to allow you to weather a recession, or survive the loss of one major employer. You should shy away from markets where there exists one major employer that would tank the market if it left or started layoffs. We prefer the focus to be on industries that are “recession-proof” which would be 1) government 2) healthcare and 3) education employers. Would you invest in the future of this town? 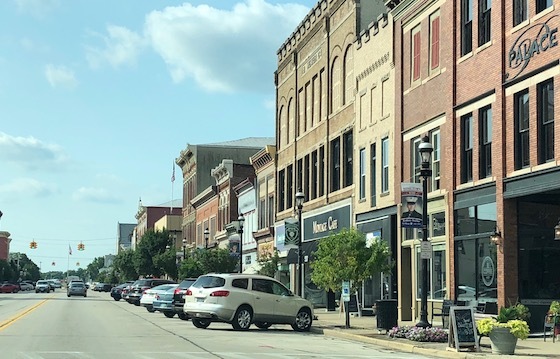 In many ways, when you invest in smaller markets you are, effectively, investing in that town. As a result, the key question is “would you invest in that town as a stock?” If the answer is “no” then you should probably not buy a mobile home park there, since we all know that real estate is all about “location, location, location” and mobile home parks are no exception. You can invest in smaller metros as long as those metros are worthy of investment. Use these tips to stay clear of markets that are not fertile and lack the dynamics necessary to succeed. 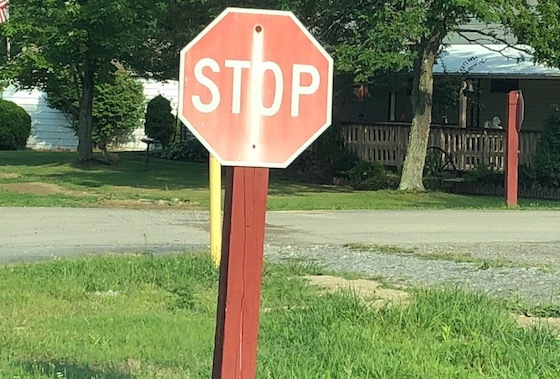 This is a stop sign in a park I drove through recently. Is this acceptable? Absolutely not. It’s one of the dumbest things you see in parks these days. Why? Interior signage is insanely inexpensive to fix. You can replace an old, rusted metal post with a 4’ x 4” post, sleeve it in white PVC, add an attractive white PVC cap, and one brand new aluminum sign for under $100. At that kind of price point, it’s impossible to rationalize not getting this job done. If we were talking fancy aluminum posts with architectural grade signs – at a cost of $1,000 per unit – then you might have an excuse. Whether your park is in North Dakota or Louisiana, you can find all of these parts in your local area, or on-line. You can get the posts at WalMart, Home Depot, Lowe’s or any supply store. And the signs can come from local spots like Fast Signs are on-line providers who can ship them to you next day. This also means that you can have uniformity of signs across your entire portfolio. Some things in mobile home parks take time to institute because they are on the lots that you rent out and you require participation by the resident. But in the case of signs, they are always on strictly the park common areas and you need no permission from anyone to remove and replace them. You could literally replace every sign in one weekend with a competent crew. Another great thing about replacing the signs – this small investment lasts for years. How long have the old, rusted signs in your park been up: 50 years? These new signs are made of PVC and aluminum, so they can’t rust. The only thing that will happen is fading. So this is a great investment that you don’t have to repeat for years or decades. Old rusted, bent signs do a huge amount of damage to the first impression of your property. This one item can literally reduce the appraisal by raising the perceived cap rate. Mobile home parks don’t have a lot to work with in impressing the visitor: 1) roads 2) signs 3) trees 4) mowing and 5) common area structures. So there are very real punishment issues in having bad signs. Before you run out and start putting those signs in, you should call and get utility locates through national networks in your state like Dig Test. One mistake in this arena will make you seemingly inexpensive sign replacement plan into a total mess. It’s free and easy, so why would you possibly not play it safe? Replacing your old interior signage is always a smart plan. It’s inexpensive, easy and fast, and you control all the pieces. Are your signs looking shabby? In 1989, the Berlin Wall came down. Built at the end of World War II, it separated East and West Germany, and there seemed to be no chance that it would ever be removed. Then Ronald Reagan got elected, sentiment changed in Russia, and next thing you know it’s breached and then removed. There’s a similar wall in the mobile home park industry that we call the “Stigma Wall”. It’s built by unfair media brainwashing that our customers are lowlifes and our product old, dirty and depressing. So where’s our Ronald Reagan? What can bring down the “Stigma Wall”? 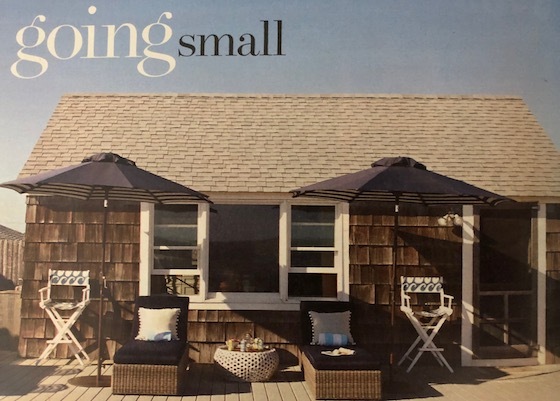 Magazines have been doing a great job of paying homage to the concept that smaller spaces are “hip” and in-fashion. But we’ve not seen a single mainstream television show devoted to this concept, other than HG’s ‘tiny home” series. It would be awesome if a major network could field a show that shows people living in small spaces in a positive light. Since the negative shows have gone off the air by now (like Trailer Park Boys and Myrtle Manor) we need some productive shows that reflect the new industry out there. Young people have brought new love to old products. Uber and Lyft have changed the taxi industry, and the affection of younger audiences – particularly Millennials – for living in smaller spaces is great for the mobile home industry. 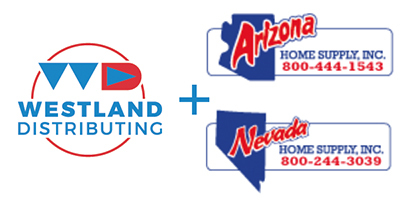 Already this group is a big part of what is propelling the RV industry to new heights. Just because Baby Boomers have a terrible and unfair stigma against our product does not mean that new generations have to follow suit. 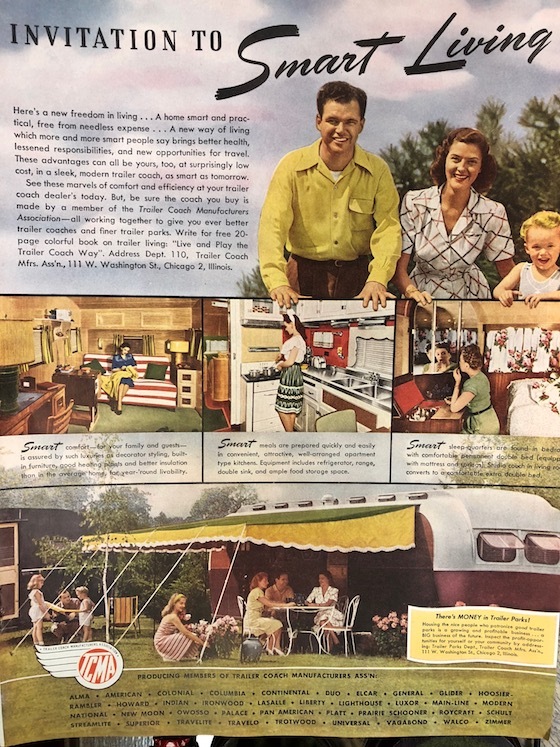 Let’s also not forget that tastes tend to run in cycles, and 1950s mid-century modern is coming back in style, and mobile home parks were at their best during this period. It takes about 50 years for a period to cycle back to popularity, and it’s finally becoming time for mobile home parks to be “hip” again. That explains why you see so many mobile home mentions in so many magazines, as the editors have realized that we’re a part of that nostalgia. The RV industry is a textbook classic in good marketing. They are featured in every publication with glowing commentary. Their “Go RVing” ad campaign has been hugely successful. As a result, RV sales in the U.S. are at the highest level in history. Since we are a close cousin to the RV sector, perhaps some of their success will rub off on us. It comes as no surprise that every time a new buyer fixes up that older mom & pop acquisition, it improves the general impression of the business model by the general community at large. As we life the industry up – one property at a time – the sum of this effort should show positive results. As Marriott once said “it’s the little things that make the big things possible”. With perpetually better park management, the stigma should decline. And let’s not forget the ability of the MH industry to blow its own horn and make things happen in the same manner that the RV industry has. Before you blame any association group for not doing more, remember that big ad campaigns like “Go RVing” cost big dollars, and everyone would have to participate financially. To date, only Clayton Homes has taken this initiative and borne the cost of injecting very positive industry ads during college football games. For the industry to make progress in this arena it will take a huge financial commitment. But maybe we can all inch towards this goal over time. It is our belief that the “stigma wall” against mobile home parks will come down over time. It won’t be immediate, but you can already feel the cracking going on. Just hang in there and do your part. The normal sign you see in the yard of a mobile home is “For Sale By Owner” – typically a cheap sign from Walmart with the phone number scrawled on with a Sharpie. But in some parks, you see actual realtor signs like ReMax and Century 21. What does it mean when you see big league realtors selling homes in mobile home parks? Realtors work on a commission basis. They will not get involved in selling a home unless the sticker price yields enough to make it worth their while. $10,000 mobile homes don’t work for a ReMax agent. But $40,000+ do. So it’s a pretty fair guess that the price on the home with a realtor sign is not going to be cheap. And that means that the park is in a highly desirable location with high home prices. Realtors are not going to go to showings if they feel physically threatened. Nor are they going to represent sellers who are unreasonable or unpleasant. 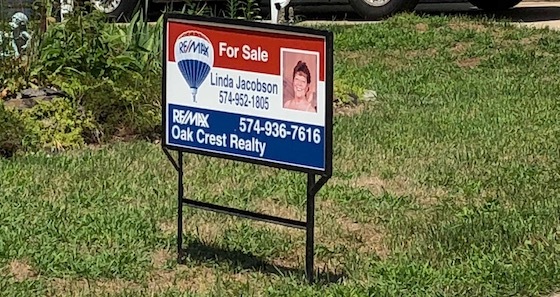 So the very existence of a realtor sign is a clear indication that everyone involved – both buyer and seller – is a notch above the typical mobile home park clientele. Realtors will not even bother putting up a sign if there’s not a good likelihood that their phone will ring. But a park in a hot location will garner sufficient demand to make a sale likely. It’s always a good bet that any park with realtor signs is in a highly desirable location – with great schools, low crime, and a charming community. Yes, you already guessed it. These are exactly the types of mobile home parks that you want to buy. I went in one of our best properties a couple weeks ago, and was delighted to see that every single “For Sale” sign was that of a realtor. That means that the park has achieved the same status as a traditional subdivision. When you pull in any park that has realtor signs in it, you should be extra interested in that property. Realtor signs are a great affirmation that the park has the basic mechanics to be a terrific investment.